Several purchasers were delighted with the color and print of the Vans MLB SK8-Hi. They specifically mentioned the blue colorway and called it, “the best shade of blue” because the uppers and the laces were indeed Pantone 294 Dodger Blue. The high-top sneaker was commended by a good number of reviewers for its excellent craftsmanship. They added that the embroidered logo at the back of the Dodgers Blue colorway looks clean and well-stitched. Some customers detailed how many compliments they got when wearing the Vans MLB SK8-Hi. They also recounted how people would ask them where they got their shoe. A few individuals noted the high-top sneaker’s perfect fit. One person thought that even with the high-cut profile, the Vans MLB SK8-Hi still felt light on the feet. A reviewer complained that the color of his Vans MLB SK8-Hi sneaker faded in just a month. One individual reported that his Vans high-top’s sole was detaching from the upper after just a few wears. 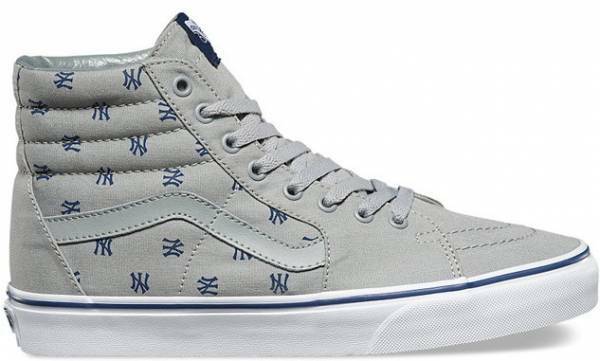 The Vans MLB (Major League Baseball) SK8-Hi is not only a must-have item for Dodgers or New York Yankees fans and sneakerheads but also for people who simply love quality kicks. The shoe has a well-crafted style that will turn heads without being too flashy. From the well-stitched logo at the heel down to the colorway and the perfect fit, this sneaker just exudes excellence that comes from a well-thought-out design. The Vans MLB SK8-Hi traces its DNA back to two iconic shoes. The first is the SK8-Hi which is the brand’s first-ever foray into high-top skating shoes and the second is the Old Skool on which the SK8-Hi silhouette was based on. The Old Skool debuted in 1977 as Style #36. It was the brand’s first ever skate shoe to utilize leather panels for enhanced durability and was the first model to be seen with the Vans Sidestripe, then known as “the jazz stripe.” This model was initially released in three colorways including the royal blue version famously worn by Stacy Peralta. The SK8-Hi, meanwhile, was launched in 1978, a year after the Old Skool. It was known then as Style #38 and took skating performance to a whole new level. The high-cut profile of the sneaker shielded the ankles from a lot of abuse that was thrown at it and brought a new look to skating as a whole. To this day, the silhouette remains as relevant as ever with the model being utilized for the brand’s skateboarding and BMX collections. Feel one with your team with the Vans MLB SK8-Hi shoe. This sneaker will get you compliments from fellow league fans like yourself or sneaker enthusiasts who know a good shoe when they see one. Keep it casual by wearing the sneaker with skinny jeans and a denim jacket over a tee or elevate the look to new heights by dressing the shoe up with a structured black coat and cropped jeans. The Vans MLB SK8-Hi is available in men’s sizes ranging from 4.5 to 13. Since the kicks have a universal appeal and a lot of women buy the shoe as well, women buyers are advised to go one and a half size down. The high-cut profile provides enhanced ankle support, a cushioned footbed gives outstanding comfort, and a traditional lacing system will keep your feet securely tucked in while you ride your board. The Vans MLB SK8-Hi retains that iconic look that has been beloved of generations of skate fans and gives it a subtle new update. Uppers in a rich solid hue or emblem logo prints catch the eye while skate-worthy performance features will keep you a fan for life. The high-top sneaker contains a reinforced toe for added protection, padded high collar for comfort and support, vulcanized construction for outstanding board feel, classic Vans waffle tread outsole for traction, and cushioned footbed for all-day riding comfort. The Vans MLB SK8-Hi was launched in the summer of 2016 as a collaboration between the brand and Major League Baseball. The silhouette was released in two versions. The first is a Dodgers Blue colorway which featured an upper in a blue hue with the club logo and Vans Sidestripe in white. The second is a Yankees edition which had the blue club logo printed all over a white or grey upper. The high-top shoe has a sturdy canvas and suede upper, padded collar, signature rubber waffle outsoles, and reinforced toecaps.